Wilson works at the Tseng College supporting the Associate Dean John Binkley. Photo by David J. Hawkins. Nicole Wilson with Dr. Sheila Thomas where Wilson was recognized as the CSU Extended Education Emerging Leader. Photo courtesy of Nicole Wilson. Nicole Wilson ’05 (Political Science), M.A.’17 (Education) is a prime example of a hardworking Matador. 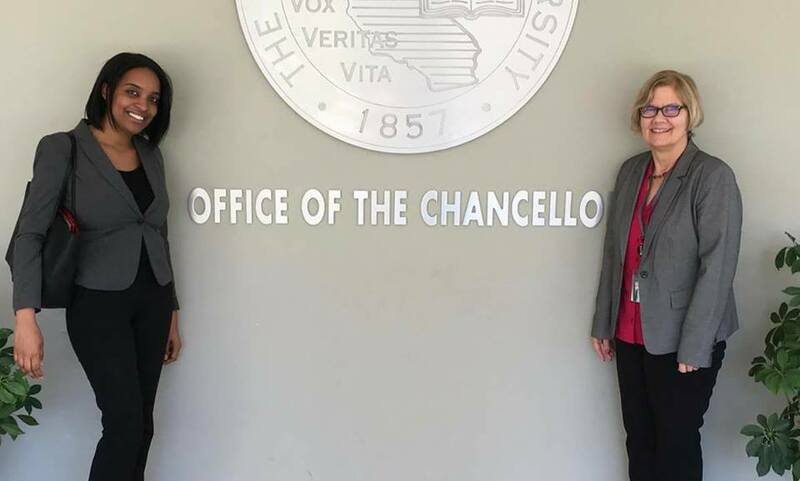 In April, Wilson was invited to the California State University Chancellor’s office by Sheila A. Thomas, assistant vice chancellor/dean of Extended Education, and honored with the Emerging Leader for Extended Education award for her work in California State University, Northridge’s Near Peer Mentoring program. Wilson is the co-creator of CSUN’s Near Peer Mentoring program — where students help one another by acting as mentors in developmental math courses. The program’s development began in 2015 and launched this past spring. As graduate students, Wilson studied faculty diversity and developmental math and her partner Jesse Knepper, studied autism. The two decided to focus and collaborate on the developmental math research. The Near Peer Mentoring program was proposed to The Clinton Global Initiative campaign, named after President Bill Clinton. In 2015, Knepper and Wilson learned about the initiative from CSUN President Dianne F. Harrison’s announcement and call for entries. CSUN fully funded the program after it was accepted by the campaign. “We proposed a mentoring program where students placed in remedial math could partner with other students [taking] remedial math, so they can help each other succeed,” Wilson said. Knepper, program manager at CSUN’s Tseng College for Graduate, International and Midcareer Education, said that the partnership with Wilson and the peer mentoring program were great experiences. While Wilson was earning her master’s, she used her time responsibly. She said she had a knack for being productive and finding time to help others or study. “I would plan ahead and get all my work done, [and would use] my lunch breaks to study or to volunteer for the mentoring program,” Wilson said. Wilson also developed relationships with several organizations on campus [to further the Near Peer program]. She is part of the CSUN Graduate Leadership Council, ExCel Board (Experience Confidence and Enjoyment in Learning), CSUN Student Outreach and Recruitment, CSUN Black Alumni Association and had participated in the CSUN Educational Leadership & Policy Studies Graduate Student Orientation. These opportunities gave her the chance to help others and contribute to student success, she said. “It’s all about developing relationships with people, and people hearing my passion for all students,” she said. Wilson remains involved with ExCEL, which provides resources to help students learn about some of the psycho-social challenges that may be interfering with their academic success. The goal of the program is to provide a class for students on academic probation, to help boost their grade point averages. Wilson said she appreciates her support system of family, co-workers and former professors. As an educator, Wilson aims for student success by focusing on marginalized students and collaborating with university colleagues to help boost graduation rates. 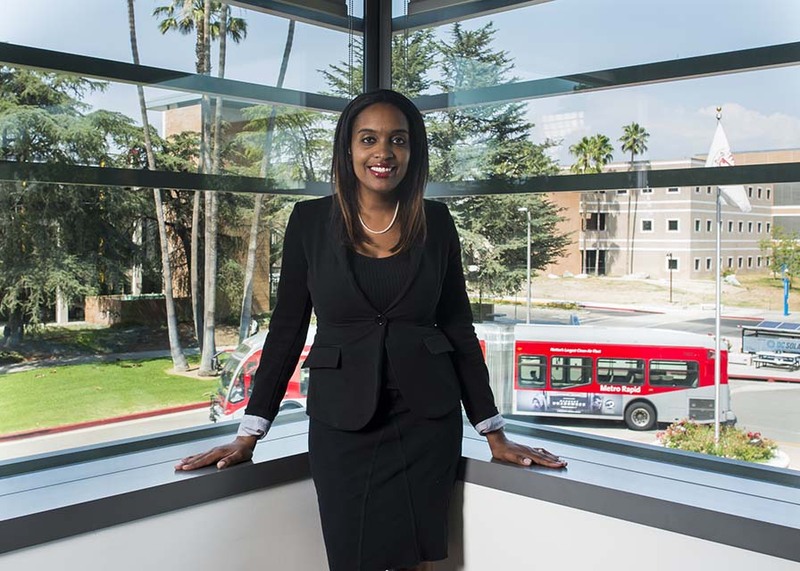 She hopes to meet the CSU’s 2025 graduation initiative to increase CSUN’s four-year graduation rate to 40 percent and six-year graduation rate to 70 percent, she said.